All London Mayoral Candidates Invited to stand with placard of their choice. On that day a lone protester, Ryan O’Sullivan is facing a criminal trial in Westminster Magistrates Court, for simply standing in Parliament Square in October 2014, with a placard stating “Occupy Democracy”. He was protesting at the hijacking of our democracy by corporate lobbyists. He is charged with breaking the Parliament Square bye-laws adopted by Boris Johnson, which require permission to hold a banner in the square. 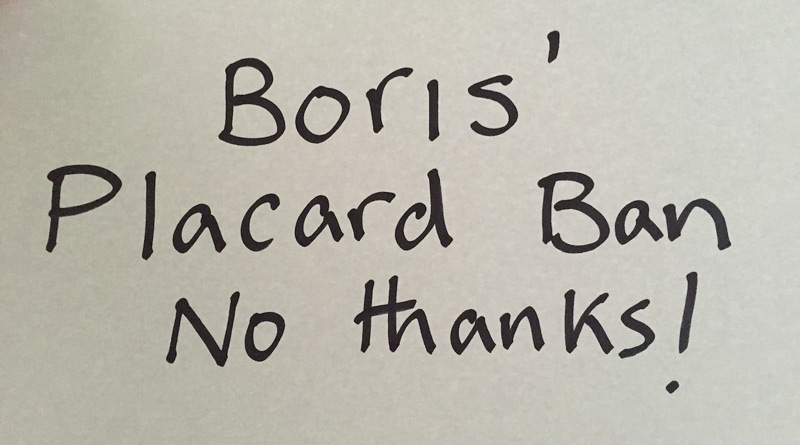 When he applied for permission last week to hold a banner protesting against his arrest for holding a banner, Boris Johnson’s London Assembly refused him that permission. The reason they gave was that even though he was applying for permission to hold one banner, he had not provided proof that he had £5 million worth of public liability insurance, which they were insisting that he have.